A regisztrációval elfogadom az Eulogis Felhasználási Feltételeit, Adatvédelmi Irányelveit és Garanciális Feltételeket. Köszöntünk az EUlogis.comportálon. Ha tovább használod a weboldalunkat, azzal elfogadot a felhasználási feltételeket és az EUlogis.com adatvédelmi irányelveit. Ha ezek bármelyikével nem értesz egyet, kérjük, ne használd a weboldalt. Az angol nyelvű verzió mindig felülbírálja a lefordított szöveget. The term 'EUlogis' or 'EUlogis.com' or 'us' or 'we' refers to the owner of the website. The term 'user' or 'client' or 'you' refers to the person who uses our website Eulogis. It's very important to know that our services are dedicated just for juridical persons and we don't allow any other type of persons. EUlogis.com refers to NVM New Vision S.R.L., owner of EUlogis.com, a Romanian company, with the following Registration Number: RO31550098, Trade Office Reg. No. : J37 / 140 / 2013, and its registered office at: Alexandru Vlahuta 4, Vaslui, Romania. 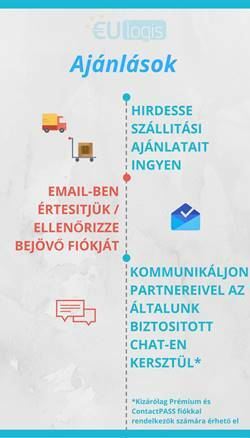 EUlogis is a great provider that offers high satisfaction combined with confidence and security in this online exchange environment and it's owned by NVM New Vision S.R.L., available in many languages: English, German, French, Spanish, Italian, Portuguese, Dutch, Swedish, Norwegian, Danish, Finnish, Polish, Hungarian, Czech, Romanian, Russian, Bulgarian, Greek, Turkish at the web domain: www.eulogis.com. EUlogis is a web platform useful to both carriers and their customers, the place where they get in touch with each other and the place where offer meets demand for transportation of any kind of goods. EUlogis is an unique platform based on professionalism and security in transportation because it includes the latest technology and high standards in this business. - Clients can delete their EUlogis account. Regarding this aspect, they will make a request using the contact form on the site. - In order to fully use EUlogis, each company must be validated after registering on site by filling in all company details as requested and by uploading / sending a copy of the Registration Certificate or an equivalent document; Premium accounts are also granted access to all details in the system although the company will be shown as "Unverified" if no documents were provided for validation. "Verified" label means the company documents like Certificate of Registration or something similar were uploaded in the system. - To not engage in spam, hacking, fake ratings or other malicious activities on the site. Any such activity will automatically result in account termination, banned IP, or an eventual court action. - To not engage in data harvesting, with the purpose of promoting other services, complementary or in direct competition. Users understand that such practice is forbidden by EUlogis; the website owners will terminate the account immediately and start court action for the recovery of the damage sustained. You agree and understand that you are responsible for maintaining the confidentiality of your account and password and for restricting access to your computer or device. Also, you agree to accept responsibility for all activities that occur under your account and password. The client knows that EUlogis can't control and don't provide any kind of suggestions or conditions concerning the safety of the information passing through the internet. For security and eradication as possible and as efficiently between members EUlogis fraud, any company has the obligation to declare legal data upon registration of the company: unique registration number with the Trade Register, the registered office, administrator's name and company locations where the company operates EUlogis accounts (workstations, offices, etc. ) and postal correspondents address, phone, fax, etc., the dates mentioned in the application form. EUlogis reserves the right to change the access options to the platform. General access costs may be applied to each account type, and prices may be changed without written notice. EUlogis may offer at its discretion free premium features to user accounts; offer codes used to access such services may not be combined in any way. EUlogis reserves the right to suspended premium features or accounts found to have abused promotional terms and also charge-back users for potential losses incurred by the platform. The ContactPASS feature is offered to all users that successfully verify their account identity by uploading company documents in the system for EUlogis to check. This feature is available starting January 2018 and will be made available to all members for a limited period. Feature may be discontinued at any time by EUlogis.com. This website contains material which is owned by or licensed to us. This material includes, but is not limited to, the design, layout, look, appearance and graphics. Hotlinking any resources from EUlogis.com servers is completely forbidden unless written approval has been provided. Reproduction is prohibited other than in accordance with the copyright notice, which forms part of these terms and conditions. Unauthorized use of this website may give rise to a claim for damages and/or be a criminal offence. We reserve the right to suspend access to our website to users found to have an abusive behavior that affects in any way our services. From time to time this website may also include links to other websites, as informational or advertising channels. These links are provided for your convenience to provide further information. They do not signify that we endorse the website(s). We have no responsibility for the content of the linked website(s). Your use of this website and any dispute arising out of such use of the website is subject to the laws of Romania. Neither we or any third parties provide any warranty or guarantee as to the accuracy, timeliness, performance, completeness or suitability of the information and materials found or offered on this website for any particular purpose. You acknowledge that such information and materials may contain inaccuracies or errors and we expressly exclude liability for any such inaccuracies or errors to the fullest extent permitted by law. Changes to these terms and conditions - NVM New Vision S.R.L. may vary these terms and conditions from time to time without notice to you. Such changes will be notified to the Customer by posting on the web site at www.eulogis.com. Changes in this manner will be deemed to have been accepted if the Customer continues to use the Service after the date of posting on the website. NVM New Vision S.R.L. will not be liable in respect of any failure to comply with its obligations under these terms and conditions as a result of any cause beyond its reasonable control including without limitation an Act of God, inclement weather, act or omission of government or other networks or other competent authority or other party for whom NVM New Vision S.R.L. is not responsible. - The client accepts and confirms that he has read the terms and conditions. If you don't agree with this terms and conditions please do not use this site. EUlogis.com is a registered TradeMark, owned by NVM New Vision SRL. NVM New Vision SRL is the owner or authorized user or licensee of all the intellectual property rights in the EUlogis.com website and its content including, without limitation, any copyright, patent, registered design, trademarks, service marks, source codes, specifications, templates, graphics, logos, databases, formats, interfaces, programming, the offering of services to other customers, software or any application for any of the foregoing and any modification, improvements, developments and enhancements thereof. Except as expressly provided herein, EUlogis.com does not grant any express or implied right to you in any intellectual property rights or secret information held on our servers. Az EUlogis.com egy vezető európai szolgáltató, amely kimondottan a szállítási költségek optimalizálására specializálódott. Szállítók, fuvaroztatók (gyártók vagy kereskedelmi vállalatok), vagy szállítmányozók használják az EUlogis rendszert minden nap, hogy vállalkozásuk hatékonyan növekedhessen.